Almost three years ago our first son, Fischer, was born at seven pounds, 11 ounces, and seemed to be perfectly healthy. However, at his two week appointment it was discovered that he had not gained the appropriate amount of weight (babies should be back up to their birth weight by 10 – 14 days after birth), and as new parents we were confused, worried, and even blamed ourselves to some degree. Looking back, we know that there was nothing we could have done to prevent his weight loss or improve his weight gain, but getting him to where he needed to be was very stressful, and for months we were constantly worried about him being on track. Fischer ended up being diagnosed with severe reflux, as well as a dairy-protein allergy. After my own dietary changes were unsuccessful in helping the situation, we chose to feed him only formula. He still gained weight slowly as compared to other children the same age, but he did gain, and by seven months he was a little chunk! We were thrilled that at eight months he was in the 40th percentile for weight, after spending so many months either not on the spectrum or on the very low end. Fast-forward to the fall of 2015; my husband and I were watching one of our favorite shows, Shark Tank, where we saw the Hatch Baby Changing Pad. This immediately piqued my interest because we knew we were expecting baby number two. After listening to the pitch and doing some digging online, we found that the changing pad is WAY more than just a changing pad; it has sophisticated and sensitive technology that captures baby’s weight and other important aspects related to development. While we couldn’t purchase at that time, the system was only in pre-sale, we decided it was something we would circle back to when it was released. Now I know we shouldn’t have jumped to the conclusion that baby number two would have the same issues as baby number one, but when your only frame of reference is your first experience…well, we were worried to say the least. In February, I developed a partnership with Hatch Baby and we were fortunate enough to receive one of their changing pads. We have been thrilled with it so far! Part of what we love about the Hatch system is that it has amazing tracking features. First, with it’s super sensitive technology, it accurately tracks baby’s weight — providing readings down to the tenth of an ounce. The peace of mind this brought us in the first two weeks with Barrett home was absolutely priceless. It showed us that he was gaining weight just fine, and each morning was a little celebration because this time around feeding was successful! Secondly, there is a feed-tracking system. Most people are not familiar with what this means, we certainly weren’t, but basically it tracks a breastfed baby’s milk transfer by taking weight before and immediately after a nursing session. Then, and this is perfect for someone who struggles with math, (ahem, me) the system provides an exact count of how many ounces the baby transferred from the breast. Therefore, if you know baby is struggling to gain weight and you notice after a feed that they haven’t gotten enough, you can supplement with pumped milk or put them back to the breast and encourage more nursing. This feature was so helpful during Barrett’s first growth spurt because I could see that he needed more than what he was getting! Barrett only had 1.75oz so I know that he can still have more and will be hungry again very shortly. Back to the breast we go! Lastly, Hatch Baby tracks diaper count. We’ve all heard that baby should have “X” amount of wet and dirty diapers throughout the day depending on age, but as hard as we may try, sometimes we forget to keep count. The diaper icon on the screen provides a reminder to track it each time baby is changed. How easy and convenient is that?! We also love the Hatch Baby Mobile App and the ability to share information. The mobile app is incredibly user-friendly, and syncs with the the changing pad so you’ll always have to-the-moment information. It is also wonderful because, again, you don’t always remember to write down information like exactly when baby last ate (tracked by the weighted-feed feature), or what time baby went to sleep/woke up (super easy to track with the touch of a button), or even which breast you should offer baby (also tracked by the mobile app). You can also manually add information, such as weight, if you receive that information from somewhere other than the changing pad. All information is shared between each app user so anything my husband inputs will show up on my app — or if baby is with a sitter (or grandma!) I can keep track of baby by being alerted each time they use the changing pad. I will say this; it can become addicting to track everything about baby. Some days I find myself weighing him multiple times a day. And I know that it’s totally unnecessary, but it’s almost FUN to see how much weight he’s putting on. I think my husband and I are still just shocked at the differences in weight gain between Barrett and Fischer. Another cool feature that the app provides is a development chart, based on the standard provided by the World Health Organization, so you can make sure that growth improves rather than stalls, or begins to decline. 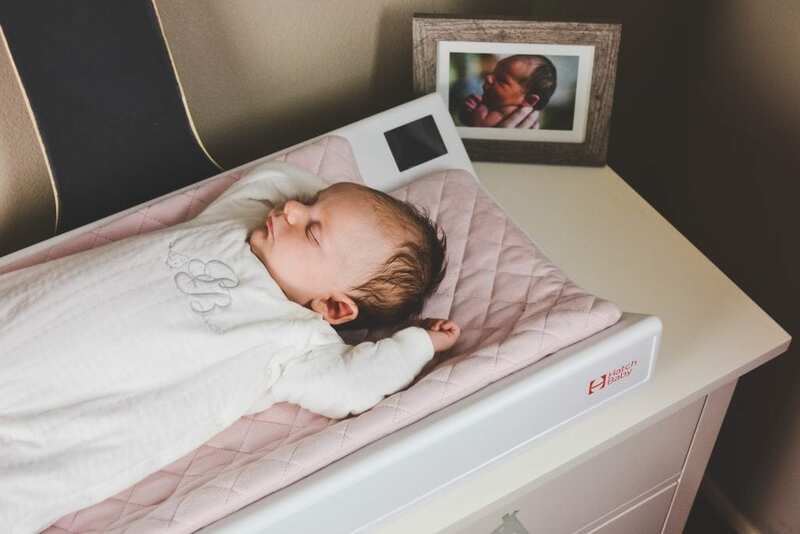 Mamas, if you are looking for an awesome Father’s Day gift for the tech-loving daddy in your life, the Hatch Baby scale would be a great choice! My husband loves the functionality of ours, and the ability to track Barrett’s growth from the app on his phone! A big thank you to Hatch Baby for giving us the opportunity to try out the changing pad!